Moms will need up to a dozen bibs a day to keep her baby dry and comfortable, and that's what she'll get with this value pack of baby bibs. KEEP MESSES TO A MINIMUM - Capture dribbles, spills and food before they get to your baby's clothing! This cute and convenient 12 pack of water-resistant feeder bibs is perfect for newborns and infants up to 6 months. ABSORBENT TRIPLE LAYER PROTECTION - Made to keep your baby drier, each bib has a stay-dry inner core to provide water and moisture resistance. The top and bottom layers are absorbent knit terry that capture a water-resistant layer in the middle means extra protection for baby's clothes and fewer outfit changes for mom! EASY CLOSURE - The handy hook and loop closure fastens securely in the back and offers more adjustability than snaps alone. This makes putting on and taking off easy! The low profile hook and loop with no exposed corners is also softer to the touch and gentle around baby's neck. UTILITY 12 PACK - Infants may use up to a dozen bibs per day! The Neat Solutions bib 12 pack offers terrific value. SOLID COLORS IDEAL FOR CRAFTING - Add your own embroidery details and customize for your little one or use to decorate and personalize for baby showers! 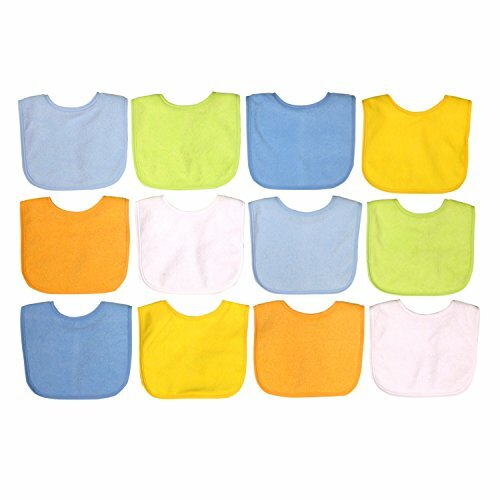 EASY CLEAN AND CARE - Bibs are machine washable and dryer safe. BPA & PVC FREE- Your child's safety is our priority which is why we created our bibs without toxic chemicals. Measures 7.5" wide by 7.5" long from top of shoulder. If you have any questions about this product by Neat Solutions, contact us by completing and submitting the form below. If you are looking for a specif part number, please include it with your message.